Google has placed itself at the heart of Britain’s National Health Service by absorbing its wholly owned DeepMind Health unit into the Chocolate Factory - data and all. It has also scrapped the unit’s “independent review panel”. Google acquired DeepMind, an attention-grabbing UK software company founded by former games developer Demis Hassabis, in 2014. After the subsidiary launched an (AI-free*) mobile phone app for NHS clinicians called Streams, the company repeatedly promised that personal data that Streams acquired would not be used by Google. That promise has been broken, critics have claimed, now that DeepMind Health is part of a new US-based initiative called Google Health. 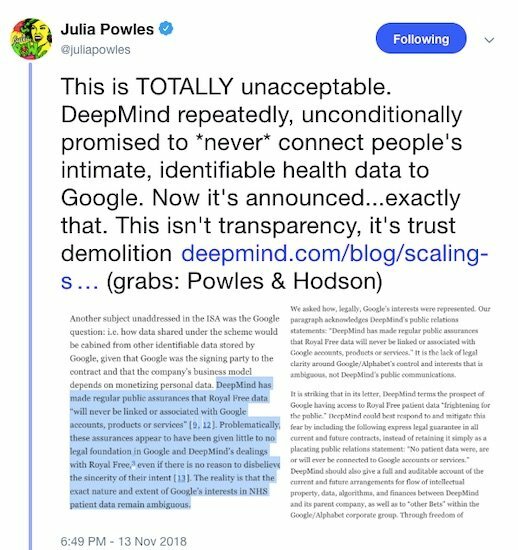 “DeepMind said it'd never connect Streams with Google,” academic and privacy researcher Dr Julia Powles wrote on Twitter. “The whole Streams app is now a Google product!! That is an atrocious breach of trust, for an already beleaguered product,” she wrote. "This move exposes DeepMind's claim to be independent as the sham it always was,” MedConfidential’s Phil Booth told us. “Google's interest isn't in Streams - an app that assessors have described as ‘not particularly ground-breaking’ - but in access to millions of NHS patients' medical records. It broke the law to get hold of the first 1.6m - after this, why would anyone trust what it says, or does?" 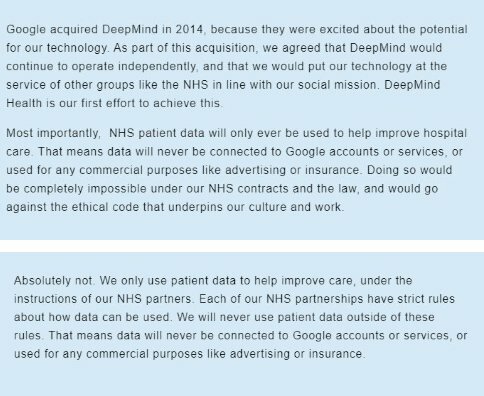 DeepMind Health has a five-year contract with 10 NHS hospitals to process the health data of 1.6 million UK patients. Last year the UK's data protection watchdog, the ICO, concluded Streams had obtained hospital patient data without sufficient consent. Patients would not have "reasonably expected" their personal data would be used to beta-test a phone app, the ICO concluded. The National Data Guardian for health and social care, Dame Fiona Caldicott, also came to the same conclusion. How worthwhile was the “independent review panel” anyway? Google has a history of announcing independent review boards which never appear or are never heard of again - silent watchdogs that never bark. The Guardian looked, but couldn't find the review board that was supposed to be created when Google acquired DeepMind. One was eventually set up by DeepMind just in time for the Royal Free scandal. But how independent was it? You decide how that would have worked.